BEAUTIFUL UNIQUE ECOLODGE in Boquia, 3 kms before Salento. Stunning gardens with 260 meters of private riverfront. Over 6 acres to explore, tranquil areas for picnics, yoga and meditation. We offer swimming the river, sunbathing in private areas, great birdwatching, massage therapy, traditional medicine and healing ceremonies, BBQs, campfires and live music!. 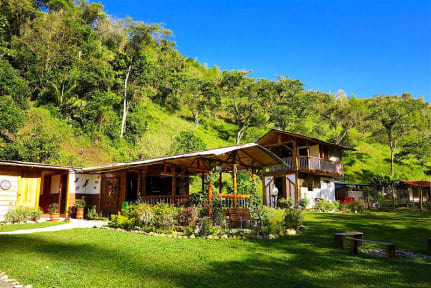 Located in a protected natural reserve … perfect for nature lovers! We have 4 private rooms, and 1 larger room (with 3 beds) surrounded by luscious flowers gardens. Beside the river, a spacious bamboo dormitory (Maloca) with 3 oversized bunkbeds, covered patio and the soothing sound of the river! Glamping in a safari tent, queen sized bed, patio with furniture. In the last two years we have re-invested every peso into making this beautiful place even more extraordinary. The gardens are flourishing, the rooms bright and cheery, solar hot water, beautifully decorated, secure covered parking, well equipped guest kitchen, large secure lockers in dorm… and the list goes on. We offer SHUTTLE SERVICE in our new crew-cab truck, fully licensed with excellent drivers. We now serve DINNER on request ... wholesome, home cooked meals! This is such an amazing hostel, surrounded by a stunning landscape. We loved that place and would recommend it to any nature lover!! We had a great stay at Refugio Puente de la Explanacion! It’s the perfect place to relax. Beautifully located in nature! We totally felt safe and comfortable. The owner and his family gave us a lot of recommandations concerning day trips, hikes and restaurants. You actually feel like being part of their family since we had a great bonfire with live music! Another advantage is that you can drink the tip water which is really special in Colombia. Great place to just relax and get away from any hectic! Everybody is really nice and helpful and the landscape surrounding your place is just amazing! Full recommendation!! Super coole Location und unser Host Ed hat sogar am abendlichen Lagerfeuer seine Gitarre rausgeholt. Wir kommen gerne wieder, top! Ed is an awesome host! The surrounding is beautiful! Very intimate and personal atmosphere. We loved our stay! After so many great reviews we booked our stay there but were dissapointed. It is true that the house is located in a beautiful garden. But that was it. The rooms and bathroom are really tiny and felt very cold. The shower water was either brewing hot or ice cold. The beds and cushions were so hard, we had backpain days after we left. No common area inside where you can sit and heat up. For food it was quite a walk till you reached the main road. No dinner or lunch provided at the Hostel.